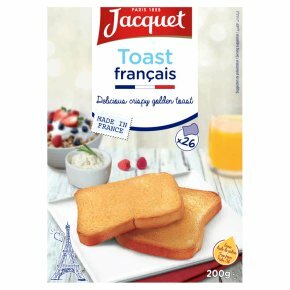 Delicious golden crispy toast.TOAST français is wrapped in two individual packs to maintain flavour. Because of its crispness, TOAST français can break when buttering. A useful tip is to support the slice being buttered with other toasts underneath. TOAST français makes a great snack with either sweet or savoury toppings and it's a convenient alternative to bread at any time of the day. Bon appetit!